The default Magento 2 platform lacks some features allowing to manage product custom options on an online store effectively. To avoid manual creation and import of custom variants for each product on your ecommerce site, you need a reliable third-party solution. With the MageDelight Advanced Custom Option Magento 2 extension, you will not need to spend your time and effort on creating each product’s option manually anymore, since it automates this process with the help of handy templates. The module enables merchants to assign pre-configured templates to an unlimited number of items on their web stores. Below, we describe the Magento 2 extension’s main features and explore how it works on the backend and frontend as well. With the possibility to create multiple templates, you will be able to assign custom options to the products according to your marketing goals. Besides, you can include various product options in each template. Also, you can choose between different types of the custom option field input, like text, file upload, multiple select, date, and more. It is also possible to configure the quantity of custom options on the frontend so that customers can choose the required number of products with the particular option. 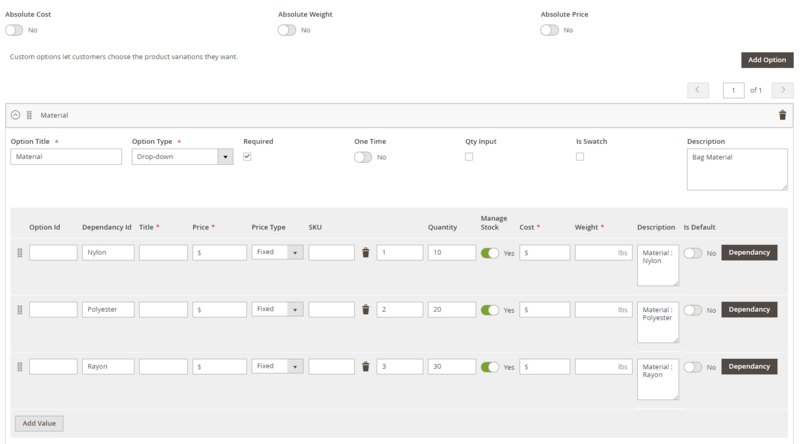 Besides, you can display product option values as swatches to improve the shopping experience of your web store visitors. Setting specific option values as default on the frontend is also possible with Advanced Custom Option for Magento 2. Moreover, the module lets setting dependency for custom option values. With this feature, some option values become available on the storefront if a customer chooses the specified option of a parent variant. It is also possible to create a matrix to manage product options combinations. With the matrix, it is easy to handle stock availability of combined custom options, so that you can inform online shoppers if the necessary product variant is currently in stock. With Advanced Custom Option for Magento 2, you can also manage inventory status for an individual product option. Another function provided by the extension is the import and export of the matrix data. This feature allows avoiding the routine process of creating each product options dependency manually. Using the import function, you get the ability to upload a CSV file with the necessary information and utilize it for assigning custom options. As for the backend user experience, besides some functions mentioned above, admins can enable the description of custom options and their values, use absolute price setting that replaces an original product price, set an option’s price as one-time for bulk purchases, and do more. Below, we describe the backend functionality in more detail. You can view and manage all created custom options templates, as well as add new templates from the Manage Option Templates page. The grid with the templates shows an ID and title of each template. From the Action column, you can edit or delete a template. The grid supports filtering and sorting. 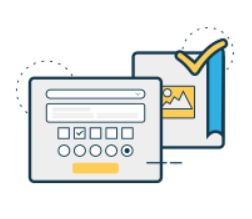 When adding a new template, you need to configure the settings in three sections: Template Information, Products Selection, and Customizable Options. In Template Information, create a name for your template. In the Product Relations tab, you select the products from the grid to which you want to apply custom options. The Customizable Options tab lets you assign multiple custom options to the template. Here you can set absolute values for cost, weight, and price. Then, specify the title and choose an input type from the options in four categories: Text (Field, Area), File (File), Select (Drop-down, Radio Buttons, Checkbox, Multiple Select), and Date (Date, Date & Time, Time). It is possible to make each option required for input on the frontend. Besides, you can allow customers to specify quantity for a product option (Qty Input toggle) and display custom option values as swatches (Is Swatch toggle). Also, you can enter a text for the option description. Other fields vary depending on the input type you choose. Note that for the Drop-down, Radio Buttons, Checkbox, and Multiple Select input types, you can set option values dependency. 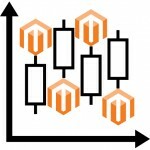 Moreover, Advanced Custom Option for Magento 2 allows exporting matrix data in a CSV file from the backend. It is also possible to import matrix data via uploading a CSV file. 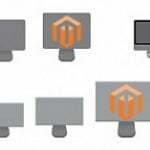 As for the Configuration section of the Magento 2 extension, here you will deal with the settings in four tabs: License Configuration, General Configuration, Advanced Custom Option Configuration, and Custom Option Inventory Configuration. In License Configuration, enter your serial and activation keys. In General Configuration, select relevant website domains that will become available after saving your license keys. Then, enable the advanced custom options extension. The Advanced Custom Option Configuration tab lets you enable a wide range of settings. Here you can allow “Is Default” feature for custom options and cost, weight, and price parameters, as well as absolute values for them. Also, enable/disable one-time options, as well as the option and option value’s description and its mode (Tooltip or Plain Text Beside Option). Then, decide whether to show option swatches, allow customers to enter quantity input, and let admins manage the stock quantity and set custom option quantity. You can also enable setting dependent option values, as well as the matrix for stock management. 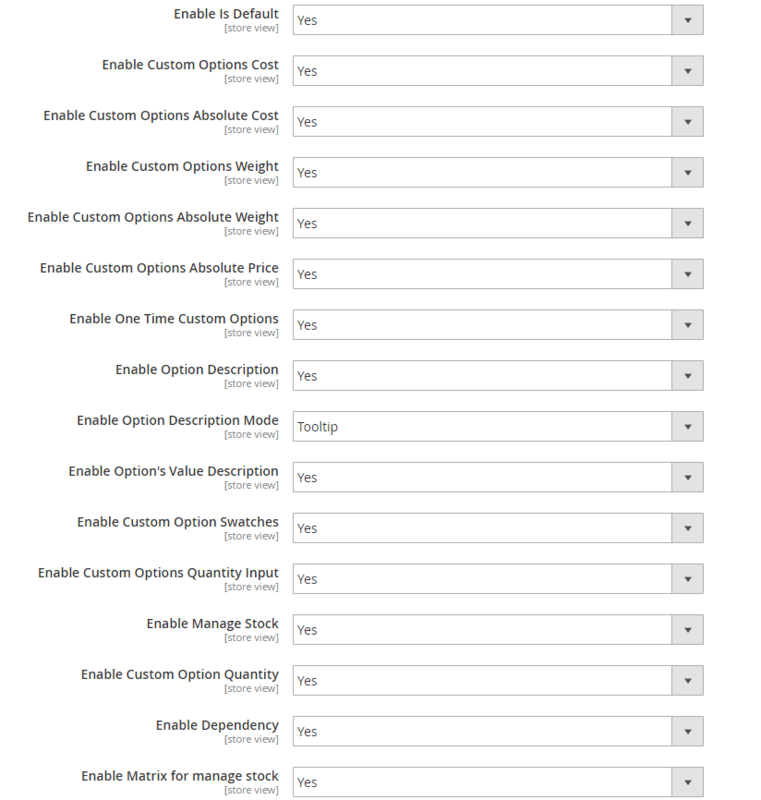 In Custom Option Inventory Configuration, you enable/disable option inventory display for storefront users, activate out of stock message, and hide or disable out of stock option values. Let’s have a look at some examples of custom product options on the frontend that you can create with the help of the Magento 2 Advanced Custom Option extension. 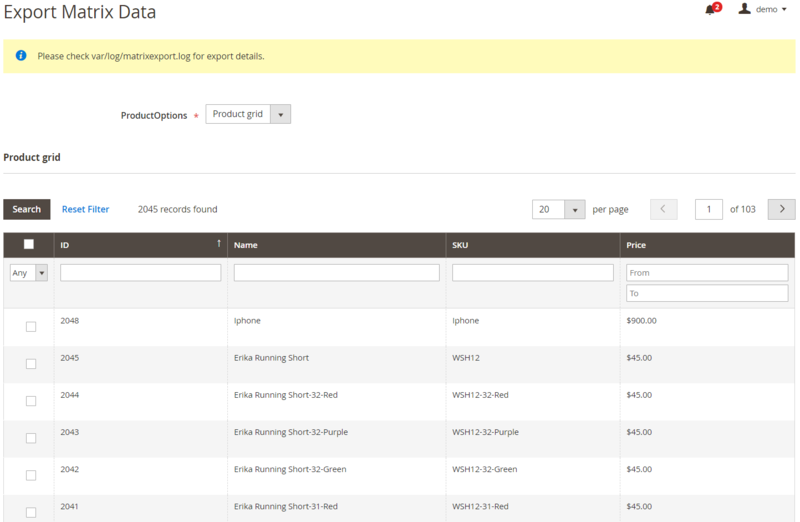 As we have mentioned, you can set product option values dependencies. In the example below, ‘Model’ is a parent option. ‘Capacity’ and ‘Color’ options become available when a customer selects a value of the parent option. 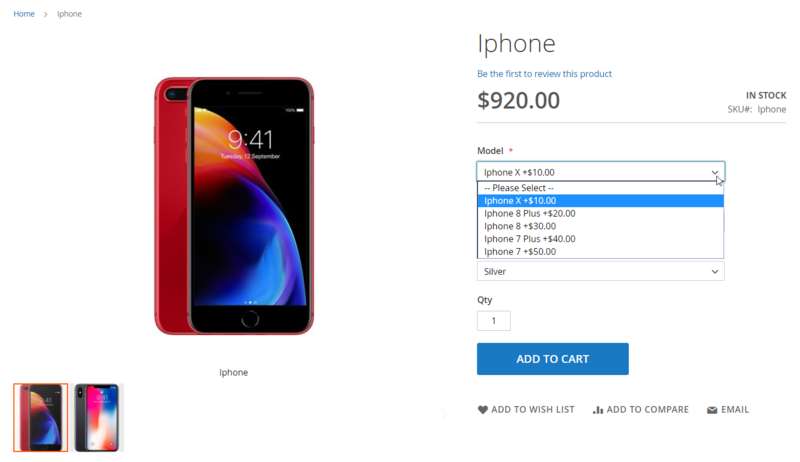 In the drop-down menu of the ‘Model’ values, you can also see a surcharge amount for each phone model. You can also use absolute price for the product options that will replace an original price depending on the selected value. Also, it is possible to set default values for particular custom options. In the following example, ‘Leather’ and ‘Brown’ values are selected by default. As you could already understand, MageDelight Advanced Custom Option for Magento 2 is a necessary tool for effective management of product custom options on an ecommerce site. The extension allows creating an unlimited number of templates with multiple custom options in each of them and assigning them to any product. Thus, you will save your time on some routine processes and will be able to apply custom options to your products most precisely. As for the price of the Magento 2 module, you can buy it for $249.